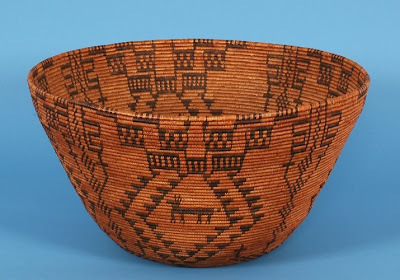 I am endlessly fascinated by historic North American baskets and I wanted to share information on an upcoming Native Art & Artifacts Auction that will take place June 6-7, 2009. The auction is organized by Seahawk Auctions in Burnaby, BC, Canada. It will feature numerous baskets including a superb Apache gathering basket with 32 stacked figures ca. 1900, Northwest Coast basketry fishing creel, Thompson River burden baskets, 19TH. C. Haida painted spruce root hat, 3 fine Pima trays, Yokut basketry bowl ca. 1900, Klikitat, Tlingit, Nuu-chah-nulth, and Lillooet baskets. I have also started a flickr Group where additional images of traditional American baskets can be seen.